On a Sabbath day, Jesus went to the home of a leading Pharisee to eat with him. The people there were all watching Jesus very closely. A man with a bad disease was put before Jesus. Jesus said to the Pharisees and teachers of the law, "Is it right or wrong to heal on the Sabbath day?" But they would not answer his question. So Jesus took the man and healed him. Then Jesus sent the man away. Jesus said to the Pharisees and teachers of the law, "If your son or work animal falls into a well on the Sabbath day, you know you would pull him out quickly." The Pharisees and teachers of the law could say nothing against what Jesus said. 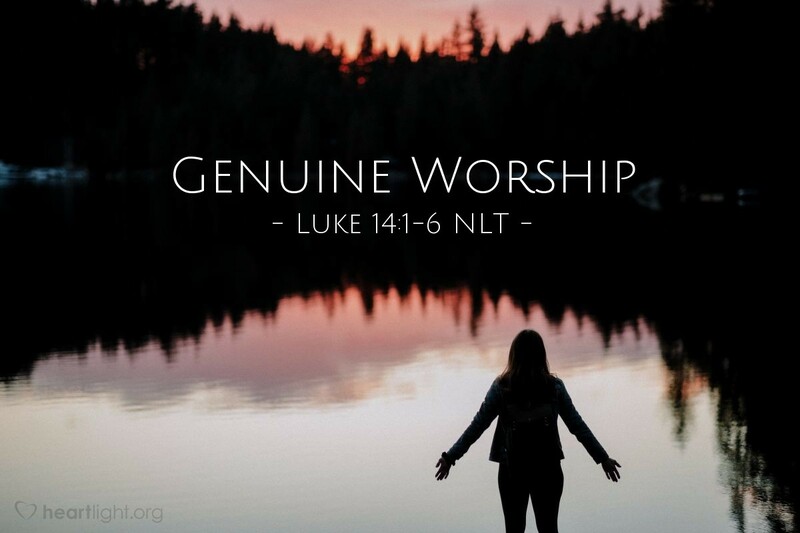 We often get our priorities so bent out of shape when it comes to worship. We can argue over the style of songs that are used, the dress that is appropriate, and even the color of the carpet. Yet God seems to be much more interested in the integrity of the heart that worships than he is in the polished facades we seek to support. God longs to bless people—to forgive them and make them whole. We must never forget this passion of the Father that is so often demonstrated by his Son Jesus. Let's remember that worship is in large measure blessing others as well as honoring God. Holy God, please be with me as I prepare my heart to worship you with my brothers and sisters in Christ. Open my eyes to see how I can bless and strengthen them as I also praise and worship you. In Jesus' name. Amen.